April went by in a flash – and here we are in May already, not that the weather has been any kind of marker for the change of season. As we turn the corner into the home stretch of the year, I wanted to describe two different programs we had during the last part of April that were of particular value to us in the Upper School. During a year that has been difficult in some ways since the election last fall, (while we have been trying to learn how to better engage in civilized conversation based on information rather than emotion), we have tried to increase our exposure and awareness to different groups and to world historical events that have had an impact on us. Beyond our traditional celebration of Black History, Hispanic Heritage, Lunar New Year, and Diwali, among others, we were treated to a presentation about the Asian-American experience by Jane Hyun, author of Breaking the Bamboo Ceiling, Career Strategies for Asians. Ms. Hyun engaged us in a dialog that was both insightful and meaningful. She explored her own life story with us, and helped us to see the various aspects of being in the United States as a person of color in a very different way than other presentations that we have had by members of other races or ethnicities. With such a significant population of Asian-American families in the School, it was wonderful to hear this particular perspective. As part of her presentation, Ms. Hyun moderated a panel of Asian-American students who also spoke of their experiences growing up between two cultures. These students spoke in compelling ways about their experiences, both in Dwight-Englewood and outside our community. After the program, students continued to reflect on what they had heard, and conversations continued over the next few days. For many students, this was the first time they had considered the experience of Asian Americans in such a manner, and that made the program a success. The second program, timed to coincide with Yom HaShoah, the Holocaust Day of Remembrance, brought a Holocaust survivor and his daughter to School. Manek Schonwetter told us his harrowing tale of perpetual running and hiding near his home town in Poland. Living in caves, or hiding in hay bales in the attics of friends, this boy and his mother and sister dodged Nazis for five years until the war ended, when they escaped to Israel, and then he came to the United States and built a full life. Mr. Schonwetter’s daughter, Ann Arnold, placed her father’s story in the context of the war and showed us some remarkable photographs of life during the war. The audience was spellbound by this story, and students surrounded him at the end of the program wanting to know more, to ask a further question, or just to thank him for sharing his story with us. 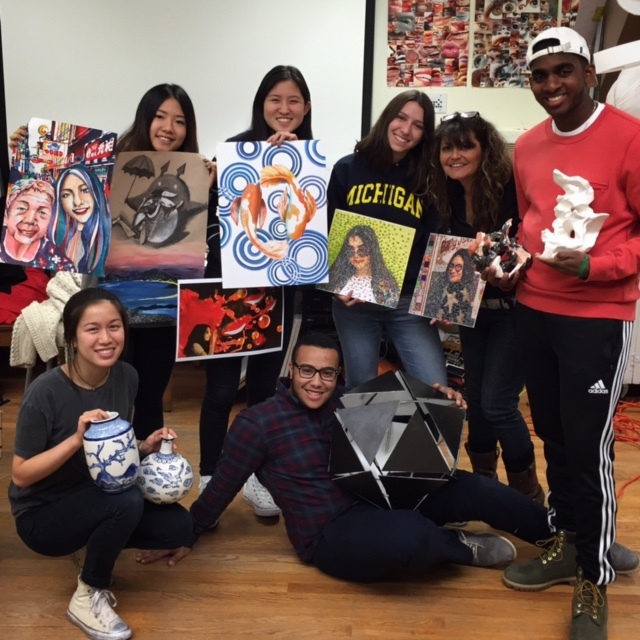 On the way to this penultimate AP, these students have honed specific skills within the coursework of all the teachers within the department: photography with Mr. McCabe, painting, illustrating & mixed media with Ms.Diaz and ceramics with Ms.Young. On the final exam day, students upload very specifically produced digital images of their work, send some original pieces by mail, and also submit a written statement. As they sealed the final envelope, we took this photograph of the group, exhausted but elated at their accomplishments of many years of hard work. The engineering class unveiled their annual Rube Goldberg machine last week, a true group effort that attempted to create a contraption that began it’s route in one corner of the classroom and ended at the far corner. Along the way were remote controlled race cars, strings being burned by candles, roller coasters, weights, all ending with a pencil that slipped neatly into a pencil sharpener. As you can see from these photos, it was a creative endeavor as well as a mechanical one. Their first attempt almost succeeded, and as I understand it they made it work on the second or third. The first try may indeed be labeled as failure, but watching the students analyze their errors and re-calculate for their next try, it was a failure destined to lead to success. Meanwhile, on the walls around the Hajjar STEM Center, other students were seen deep in their analysis of blood spatter, used as evidence in police investigations. The formation of the pattern and shape of the droplets can provide the path and angle of origin. This exercise is leading to the final project of the course, where students will be brought to a crime scene with a dead body and be asked to answer the question of how the death occurred. While not as glamorous perhaps as on television, the class will have done complex STEM work to solve the case.